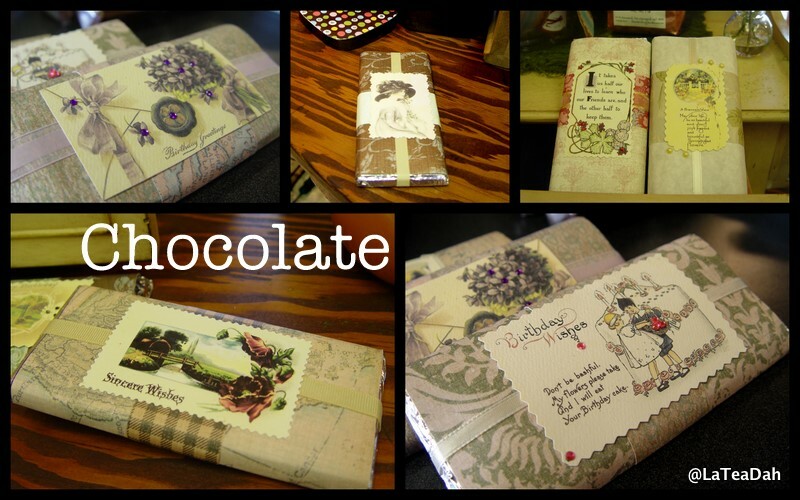 Aren't these beautiful chocolate bars? I discovered them at a coffee & tea shop in town. Each is a unique work of art and heart. Replicas of old postcards, rubber stamped verses, ribbon, and sequins artfully decorate a chocolate bar wrapped in pretty paper. I love chocolate, but these are the kinds of candy bars that I would keep forever! I do have that tendency, you know. A beautifully wrapped piece of chocolate is enjoyed in its wrapping for so long that the chocolate inside turns hard and white before I open it. By then it is not good to eat. It's actually a point of discussion in our family. The others think chocolate should be opened and eaten immediately. How sad is that? They miss the enjoyment of having and enjoying the wrap. Enjoy your day and go find yourself a piece of delicious chocolate to unwrap! Those are pretty enough to frame! They are beautiful, but why can't you have your candy bar and eat it, too? Wasting delicious chocolate is a crime! (In my world.) Ha! Okay, so this is what I'd do...I'd carefully open the package, carefully remove the delicious chocolate, carefully cut a piece of cardboard to the same size as said chocolate, rewrap the cardboard in the sweet packaging, then use the package in a vignette somewhere. Oh, you might want to run when someone, expecting chocolate, finds cardboard. I think Vee has the right idea. Eat that chocolate! Beautiful wrappers! It would be difficult to open. I think I want mine in brown paper like a hidden secret. Now I want chocolate! I have some behind my monitor here, but they are only for a desperate need. What I need today is something special. How pretty. I just bought some Theo Chocolate that Dave really likes. I ahve been stitching on a new pattern I got from Crabapple Hill. I think of you when I work on it. These are beautiful...and you know my older friend ROSE, would save these and put them sort of collage like in a frame..nothing fancy...but I know she would hang them somewhere to keep her enjoying them....she does this with cards and such..her house is a joy and delight to visit..